This is an old recipe which probably dates back to the second World War. In Malta, back then, fresh meat was scarce, so families used canned Corned Beef to replace fresh meat. It was more know as Bully Beef. 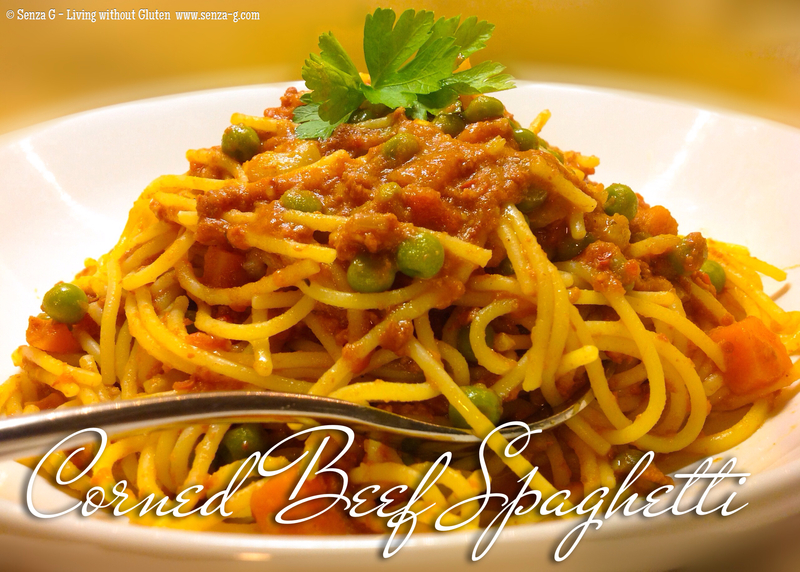 The word bully is actually an anglicized version of French bouilli, from boeuf bouilli which means boiled beef. Rather than as a pasta sauce, it was more used as a filling for meat pies. There are many versions to make this. This is how I usually make it. Put a tablespoon of olive oil in a pan and sautee the onion until soft, add the carrots, the celery and potatoes. Sautee them for a few minutes, stirring continuously. Add the red wine, the water and the stock to the vegetables. Add also, the tomato puree, bayleaf, spices and season. Bring to a boil and leave to simmer until the potatoes are very soft. If it starts to get dry add, some more hot water. When the potatoes are done, add the can of crushed tomato, the crushed garlic and combine well. Again bring to a boil. Lower the heat and add the finely chopped corned beef. Let cook for about 20 minutes and then add the frozen peas. In the meantime, boil the spaghetti. When the pasta is ready, mix the sauce in the pasta, add a splash of olive oil and combine. Plate and serve with Parmesan Cheese on the side.